We added a new feature that sends confirmation emails to test takers. After a candidate finishes a test, we will send them an email that confirms that their test results have been sent to the hiring company. 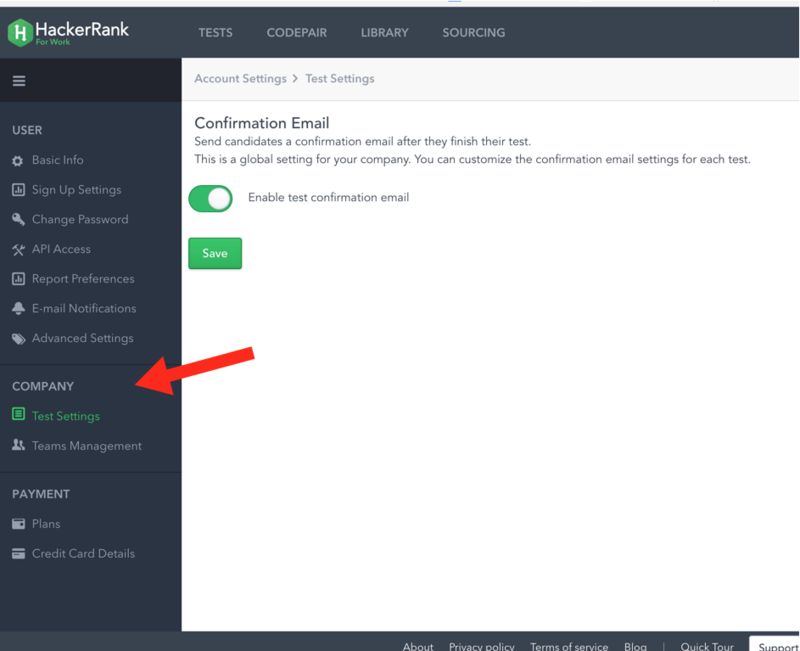 To change the confirmation email settings for a specific test, go to Tests => Advanced Settings => Emails. You will see a section called Confirmation Email, which is where you can configure the confirmation emails for this specific test. 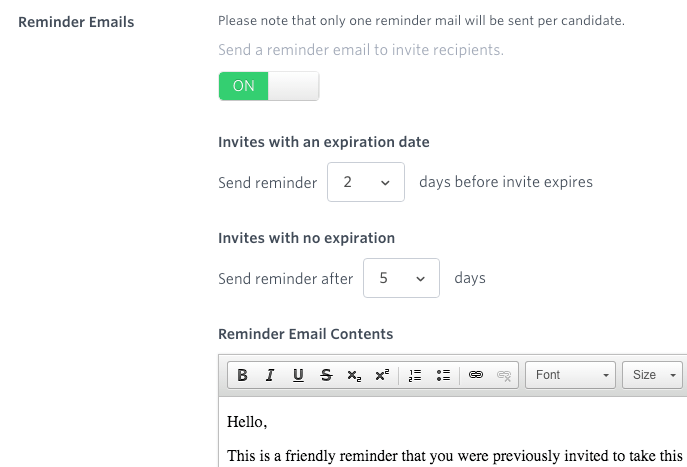 To enable or disable confirmation emails for the entire company, go to your account settings. There is a new Company section, which has a Test Settings page. If you disable confirmation emails for the company, then confirmation emails will be disabled for all of your company’s tests. Please note that you can only see the Test Settings page if you’re a member of the Owners team. Our customers tell us that they often wish each Candidate being assessed is given a different Test. The idea is to have a pool of questions of a similar kind, and have the system select a subset of questions to present to each Candidate. HackerRank for Work has long supported shuffling of Questions in a Test. In this model all candidates will see the same set of questions, but the order in which the questions are presented is different for each candidate. 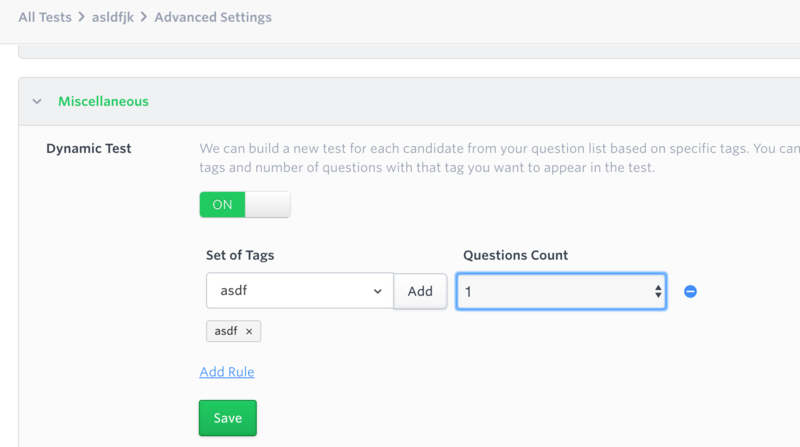 Today we are very excited to launch a new feature – “Dynamic Tests” that helps users automatically build an entirely different Test for every candidate based on specific rules. The first thing you would do to start using the Dynamic Tests feature is to add tags to the questions you are interested in using in your Test. Make sure similar questions are tagged with the same labels. For e.g. add the ‘Easy’ tag to all questions you consider easy, or ‘Polymorphism’ to all questions related to object oriented inheritance concepts, and so on. Note that questions in the HackerRank for Work library are already extensively tagged. Once you have your questions tagged, you can enable this feature by going to the Tests’ Advanced Settings page, Miscellaneous section. Once this feature is enabled, you will be able to add one or more rules, with each rule specifying the Tags to be matched and the count of questions to be picked with those tags. Note: You can specify multiple tags in a rule. For e.g. you can choose 1 question that has both ‘Easy’ and ‘Algorithms’ tags. You can also specify a second rule to select 2 questions for Logic or Data Interpretation, etc. Take this feature for a spin, and let us know what you think! 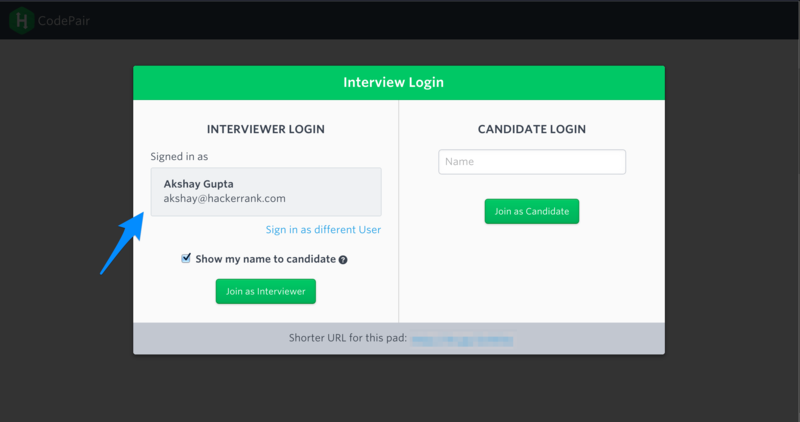 As a HackerRank for Work user, if you start a CodePair interview while already logged in to your HackerRank for Work account, it is reasonable for you to expect that you don’t have to log in a second time. Unfortunately that is not how it was. With a change that we are releasing today your HackerRank for Work and CodePair sessions share information so that you have to only log in once. Here is what you would see if you visited a CodePair link while being logged in to your HackerRank for Work account from another browser tab. This login sharing works in the opposite direction too. If you start a CodePair session, and then visit you HackerRank for Work account you will not be prompted for a password. Finally, it is important to remember that if you log out of your HRW session while a CodePair is going on, you will be logged out from both places. Don’t worry that does not mean your data will be lost, it only means you will have to log in again to access your pad. As part of a series of changes to improve the phone interview experience, our latest update allows you to choose the font size of the code written by you or the candidate during a CodePair interview. This option is available from the settings menu just like the other customization options of selecting the editor mode, turning on/off intellisense. 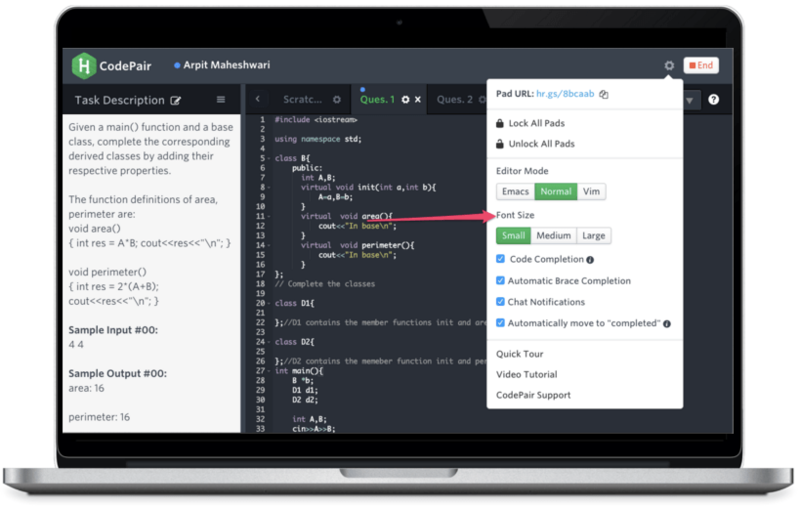 Earlier today, we rolled out an upgraded failover feature for CodePair. This allows a CodePair interview to continue on a secondary server if for some reason the primary server goes down. Even though our data center already guarantees 99.95% uptime, we believe it’s important to get that value as close to 100% as we possibly can, which is why we’re upgrading our failover system. When the user presses “Continue”, their CodePair interview session restarts on a secondary server with all of the session’s previous details and code completely intact. The interview will continue with minimal interruption and no data loss. 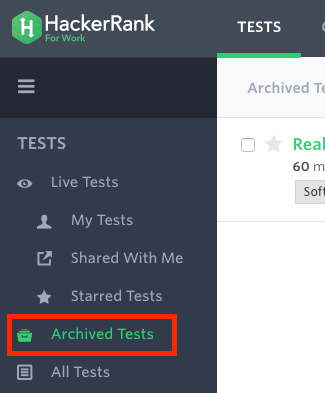 If you have any questions about this failover functionality, please write to us at support@hackerrank.com.